This episode largely takes place in the throne room. Erwin makes a impassioned plea for the value of the Scout Regiment. The nobles seem to be hasty in their decision to disband the scouts. The Scout Regiment are the branch of the Military that faces off against the Titans the most and they do so deliberately. It features the best soldiers and have the best at using omni-directional mobility gear. Disbanding without having a replacement is short sighted and will cost everyone at some point if implemented. Erwin claims that if “Wall Rose was breached, its residents would take refuge in Wall Sina again, but the earlier evacuation decimated their stockpiles. This time the residents would be forced to fight for resources and a civil war would erupt between Wall Rose and Wall Sina. Furthermore, Wall Rose is always suffering from a food shortage, so the best way to avoid war is to reclaim Wall Maria. It is the duty of the Scouts to charge at the enemy.” The nobles don’t care, avoiding answering whether they have a better plan to deal with the Titans. 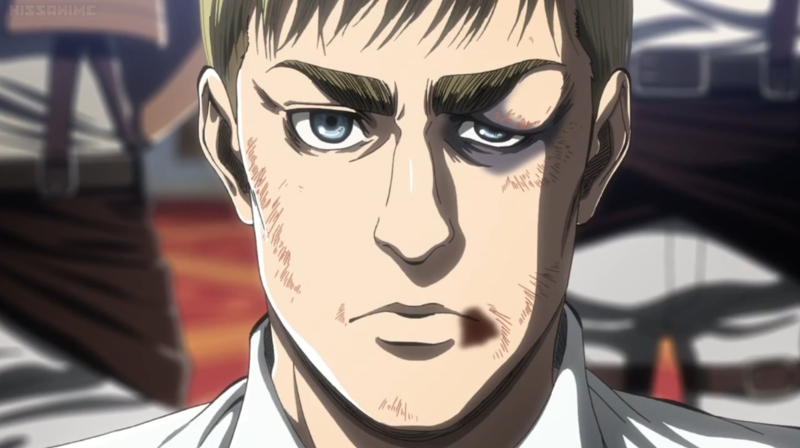 Aurille instead focuses on Erwin’s violation of the “Charter of Humanity,” which reads: “Thou shall not prioritize one’s own gain over the longevity of humanity.” Erwin’s refusal to hand over Eren to the Military has resulted in the Charter being violated. Predictably, he’s sentenced to death. Nile Dawk’s sort of represents the audience here, I think that many of us watching shared his confusion. As Erwin is being lifted to his feet, Anka Rheinberger enters the thrown room and states a clearly false claim that the “the Colossal and Armored Titans have broken through both gates of Calaneth District. The reaction from the nobles is predictable as they demand the gate be closed, leaving half of humanity to death. Nile disobeys the order, stating that he’s “a human of Wall Rose and he will not allow the gates to be closed.” Dhalis Zachary arrives with armed soldiers. He reveals that the report was false. Pyxis admits that he orchestrated the plan. What surprised me about Pyxis confession is that he was willing to let Erwin die, if the Government made a better choice for humanity. He declares a “coup d’etat.” This moment illustrates how the real power tends to be with the Military forces, after all they have the guns right. So far each episode has solve some mysteries while creating new ones. This episode is no different. 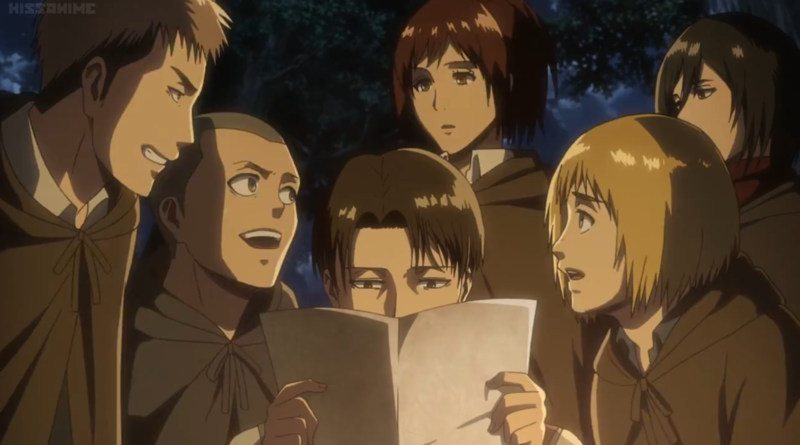 Hange explains the report that Erwin gave her. 5 years prior, the Reiss family save Rod Reiss were killed by bandits while praying in a Church. Rod found Historia right after they were killed. 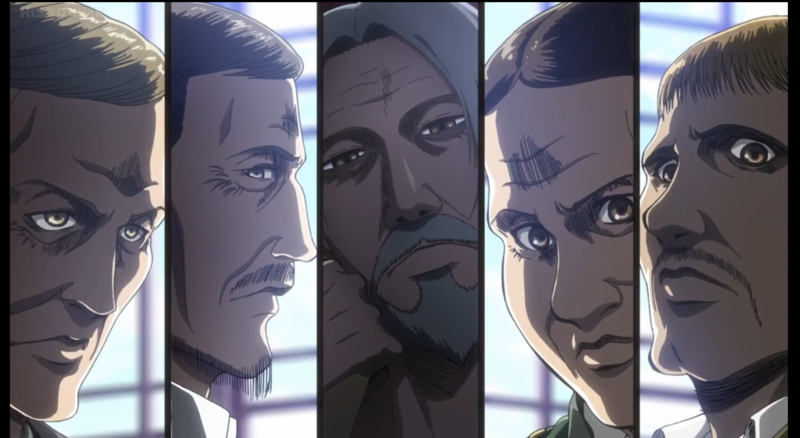 Levi concludes that there must be something in the blood of Reiss family. Hange suggests that the story doesn’t add up. The chapel was destroyed even though it was made of stone. Personally, I think he may have had his family killed, destroying the chapel to cover his tracks. 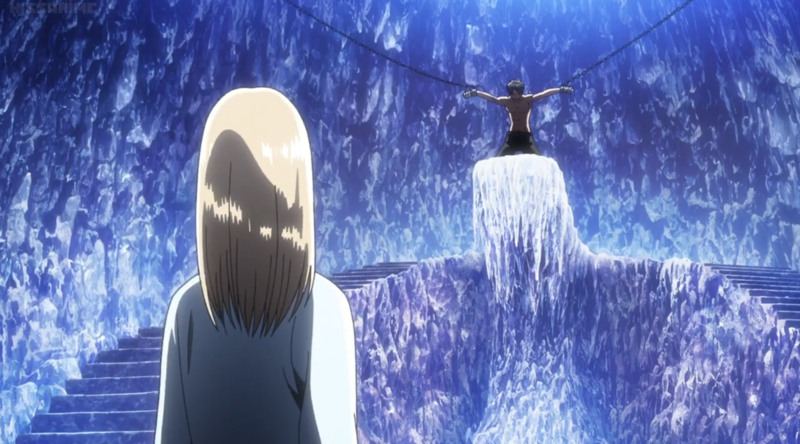 Finally, we see that Eren is chained in the Underground Chapel. I’ve mention before that Eren constantly getting captured seems to be a theme in this series. However, I wonder if the series is trying to turn the “Damsel in Distress,” motif on it head, by constantly having Eren (a male) getting kidnapped and being saved by Mikasa (a female). Anyway, Armin wonders that if “a Titan gains the powers of a person who can change into a Titan by eating them, then when did Eren become a Titan and who did he eat?” I don’t know if that’s how Eren got his powers. Considering their closeness from childhood wouldn’t Eren tell him he ate a Titan? “Damsel in distress” hahaha, I’ve always wondered. Have you read the manga? I was considering reading the manga but decided I would rather be surprised by what happens in the anime. Do they change a lot between the anime and manga? nah, it’s almost the same, the story line is slower though. I guess curiosity gets the best of me and I read the manga but I enjoy the action scenes in the anime. It is an interesting question. The audience have been asked to see Eren as the protagonist but he does fit better with the model of damsel in terms of how the plot has treated him throughout the seasons. I think this series may be shacking up our expectations. Sounds like the nobles and king are incompetent. A bit like politicians in the real world! Females rescuing the male is a nice change of pace. It would be fun to play a video game like that, although I guess it already happened in Lollipop Chainsaw. It’s interesting how it seems like the citizen just assume competence comes with power. However, it’s clear that most of the competence is with the Military. I do think the gender dynamics of this series is interesting, and more media could benefit from shaking this up.